Artwork details: Pen and watercolour, 6 x 6 inches (15 x 15 cm), 1995. This is one of the oldest pieces on this site. It was never called 'Cerberus' at the time - it was just the painting I did for that year's christmas card - the only picture I did all year in those days. 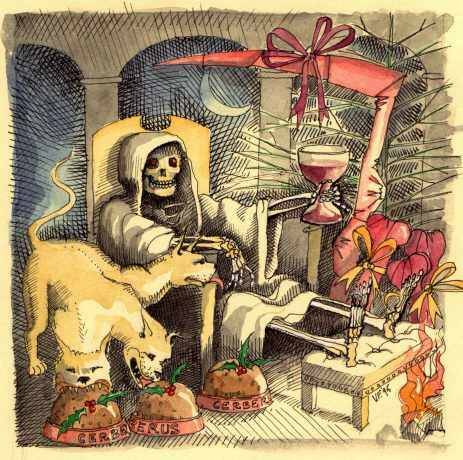 The subject of Death (fellow with the scythe and cowl) and Cerberus (who is in fact the fearsome three-headed dog of the Greek Underworld) may not seem to be a Christmas kind of theme to the un-trained eye, but the logic goes like this: Christmas is a religion thing. (being an atheist I firmly believe that religion is for Christmas, not for life - and only then because I have to go and ring the church bells, which I do badly, but that is not intentional). So, anyway, religion being a Christmas thing, I tend to think of all aspects of religion as kind of christmassy, and metaphisical manifestations of Death, with cowl and scythe, seem like they have to do with religion to me, and are therefore christmassy. Cerberus just comes in because of the whole Underworld link and I thought Death ought not to get lonely at this time of festivity. If you follow my reasoning you are among the few. well done. Also they have got Christmas presents so that proves it, it's christmassy. And clearly they must have a tree - one with no needles on, because it's a skeleton christmas tree, and it's anyway much better this way because Death doesn't have a hoover to hoover up all the needles. Obviously.